Blueberry Flea Beetle larvae are dark brown, 0.1 inch to 0.4 inch in length, and have three pairs of legs. Pupae are yellow-orange in color and are generally found 0.5 inch deep in the soil. Adults are less than 0.25 inch in length, oval shaped, and a shiny copper bronze or metallic blue in color. Blueberry flea beetle eggs and, possibly, adults overwinter in the leaf litter of blueberry fields. Adults mate and lay up to 200 eggs per female. Eggs are very small and orange in color. Egg hatch coincides with leaf bud opening. Larvae migrate to the foliage and feed on blossoms and leaf margins, giving the leaves a notched appearance. The larval stage takes 9 to 20 days to complete. Fully grown larvae fall to the soil and pupate. The blueberry flea beetle has several generations per year in the southern United States. 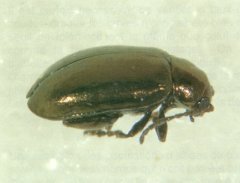 The blueberry flea beetle can cause serious damage during the summer. The adults can chew small holes on the foliage. Large numbers of flea beetles may completely defoliate large areas in both crop and pruned fields. Burning may reduce blueberry flea beetle populations. Contact your local Cooperative Extension Service for control recommendations in your region. Turner, Jay Cee L. and Oscar E. Liburd. Insect Management in Blueberries in the Eastern United States. University of Florida Cooperative Extension Service. October 1993. Retrieved 13 July 2010. Crop Profile for Blueberries (Wild) in Maine. August 1999. Retrieved 13 July 2010.